How long has it been since you serviced a client with athlete’s foot? More recently than you think, believe many podiatrists. “Particularly in the older population, the majority of the time — I’d says 70% of cases — what they think is dry skin is actually athlete’s foot,” says Sima Soltani, D.P.M., in Irvine, Calif. Stephen Pribut, D.P.M., a clinical assistant professor of surgery at George Washington University Medical Center in Washington, D.C., agrees. “I have had patients who come to me after treating their ‘dry skin’ unsuccessfully for years and the condition really is athlete’s foot,” he observes. The differences between dry skin and mild athlete’s foot are subtle (see “Not an Easy Call” sidebar), particularly with mild fungal infections. Also called tinea pedis, athlete’s foot takes several forms depending on the invading fungi. Most people visualize athlete’s foot as reddened, peeling skin and blisters that starts between the fourth and fifth toes before spreading. But it also can appear solely on the soles as thickened, dry-looking skin that flakes or peels. And it may or may not itch — just like dry skin, say podiatrists. According to The American College of Foot & Ankle Orthopedics & Medicine, 70% of Americans will experience athlete’s foot at some point in their lives — regardless of physical activity level. Men of all ages are most prone, as are people with weakened immune systems and the elderly, but just about anyone can get the condition. Drs. 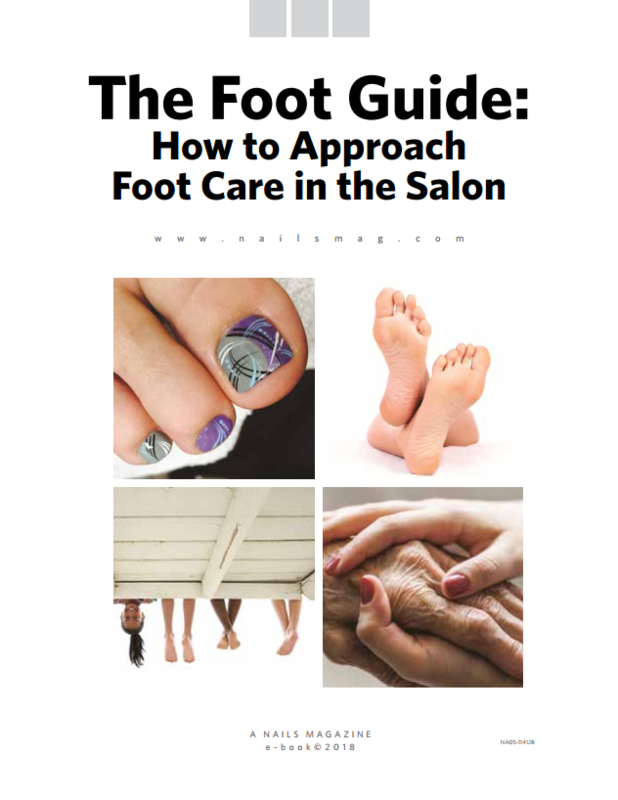 Soltani and Pribut urge nail technicians to err on the side of caution by assuming all cases of apparent dry skin are actually athlete’s foot. Throw away all disposable implements, wash metal and other re-usable instruments thoroughly with soap and water, then disinfect per state board regulations. And make stringent sanitation and disinfection procedures with the footbath a way of life. Rather than risk offending clients by suggesting they have athlete’s foot (and risk being accused of diagnosing a condition without a medical degree), engage the client in a dialogue. For example, instead of accepting her complaint of dry feet (or making that call yourself), educate her that dryness can be linked to several skin conditions. Ask her how long she’s experienced the symptoms, what actions she’s taken to treat them, and the results she’s had. If she’s been lavishing her soles with moisturizer and covering them with booties each night to no avail, for instance, let her know the dryness may be a symptom of something else and refer her to a podiatrist or dermatologist. While only a physician can make the diagnosis, over-the-counter remedies can effectively treat both dry skin and athlete’s foot. The trick, says Dr. Pribut, is to match the treatment to the condition. The cure for dry skin — intense moisturization — for example, creates the ideal conditions for the fungi that cause athlete’s foot to flourish. Drs. Pribut and Soltani recommend trying Lotrimin or Lamisil for dryness related to athlete’s foot. “OTC creams work in about 50% of the cases,” comments Dr. Pribut. However, cracks or fissures in the skin usually indicate a more advanced infection that requires prescription- strength treatment. Doctors emphasize the need to continue using the creams long after symptoms have disappeared. “If the symptoms disappear in two months, the individual needs to continue treatment for two to three additional months,” says Dr. Soltani. Symptoms in milder cases often disappear within one to two weeks, but podiatrists agree that usage should continue for at least four weeks. For those who aren’t convinced that fungus is the culprit, Dr. Pribut says he sees no harm in applying an OTC cream for athlete’s foot to feet in the morning and early evening and using a moisturizer at bedtime.When in doubt of the diagnosis, Dr. Soltani recommends treating the condition as athlete’s foot, explaining that the OTC treatments won’t worsen dry skin, while an intensive moisturizing regimen provides an ideal environment for the fungi to flourish and spread, making the condition more difficult to cure. If several weeks of consistent treatment with an OTC antifungal cream doesn’t improve the condition, it may be time to switch to moisturizers. The Joslin-Beth Israel Deaconess Foot Center in Boston recommends slathering the feet in moisturizer immediately after bathing to seal in moisture absorbed. While Drs. Pribut and Soltani defer to the individual’s preference in selecting a moisturizer, there are some differences between formulations that may guide your choice.Ointment moisturizers such as Aquaphor work best at retaining moisture in the skin, but some people don’t like the heavy, greasy consistency. Oil moisturizers are a less greasy but effective option. Next come creams, which rub into the skin without leaving a greasy residue. Lotions are the lightest, most popular form of moisturizer, but doctors caution that some contain alcohol, which can contribute to dryness. Even so, Dr. Pribut firmly believes in allowing patients to choose because they’ll be more likely to use it as directed. If thickened, flaking skin is a particular problem, he does, however advise patients to consider a moisturizer formulated with alpha-hydroxy acids (AHAs), lactic acid, ammonium lactate, or urea, all ingredients that speed the sloughing of excess dead skin. If symptoms don’t respond to athlete’s foot creams or intensive moisturizers or at least begin to improve within a few weeks, it’s time for a second opinion. Conditions such as eczema, allergic reaction, and atopic dermatitis also can mimic the symptoms of dry skin but require a doctor’s diagnosis and treatment. Sometimes even doctors have a hard time making the call between a simple case of dry skin and athlete’s foot. Compare the symptoms to understand why. Simple dry skin and athlete’s foot are the most common causes of itchy, flaky feet, but they are by no means the only ones — just see the list of other foot conditions (and the sometimes subtle differences doctors will look for) below. If symptoms don’t at least start to improve in a week or two with self-treatment, it’s time to consult a dermatologist or podiatrist. • Wash feet thoroughly with soap and water each day. • Towel-dry feet completely, including between the toes, after bathing. Some doctors even go so far as to recommend blow-drying the feet. • Trade 100% cotton socks for ones made of moisture-wicking materials. • Buy at least two pairs of well-fitted shoes and alternate wear to allow them to dry and air out. • Sprinkle an antifungal powder (baby powder works just as well, says Dr. Soltani) inside shoes each morning to absorb excess moisture. • Change socks one or more times each day.